Following on from last session which was a group critique session we had set the task of texturing at least 2 of your buildings (if time permitted dependent on building size) i chose to texture 3 of my current 5 buildings leaving marks and spencers due to size and poundworld as it would be used for a group tutorial in session 10. Texturing isnt my favourite part of the process but its one you cannot neglect or simply fly by as every artist should know a good model is nothing without a good texture as the texture bring it to life with colour or realism. There are multiple ways to texture as shown in my last year post on texture mapping which isnt all of the mapping techniques maybe just the most prominent ones. For now we are just doing simple diffuse maps for base colours, normal maps and ambient occlusion are to come after possible alpha maps if the building requires that. During the texturing we decided to leave the windows untextured as a multi subbed objects so that we could find a reflective material in unreal engine 4 that resembles glass to apply to that area for realism, otherwise we would have to texture on a flat black window with a frame which loses some immersion in the game. 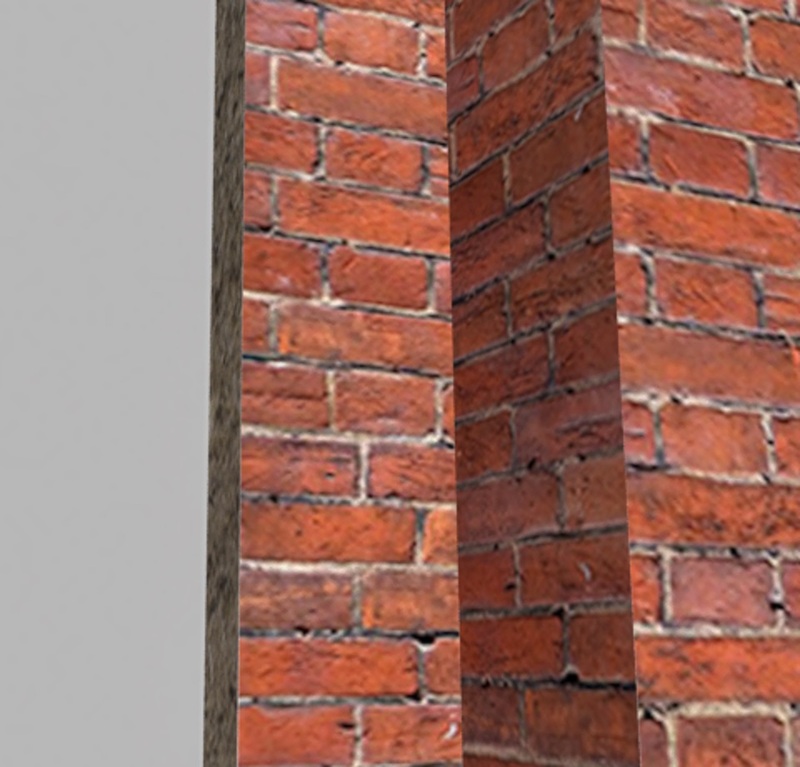 As you can see for the cheque centre (brick and blue building) i must have missed a step of stiching the seperate pieces of the pillars together to the building to create a seemless brick texture, the texture is tileable just its an error on my behalf of positioning. 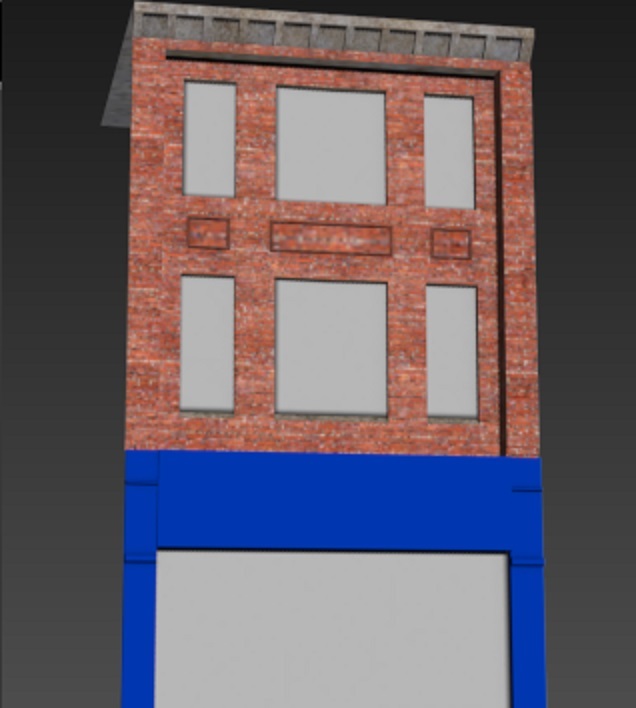 The brick itself is the right size and looks nice though so i have packed my uvs nicely to give the main part of the building higher resolution. I was pleased how quick silver turned out (red and white building) wasnt a difficult texture really just the seperate colours to uvw unwrap in groups then pack together so i knew which to paint which colour, for the main bit of the building its not plain paint its like a plaster so i have textured it as a plaster. Then crawshaws turned out just as well as quick silver, i had a slight issue where one uv had been packed into the wrong section so i had a random green part on the white section but simple rearrangement sorted that out. As you may have noticed before i did the texturing i have added a significant amount of detail to crawshaws now all its missing is the elegant flowers on the facure which will have to be sculpted and baked in a normal map later on in the process. Staue hunt, find pieces to make the in game statue down a alley off whitefriargate. important 60s items hunt- Anything relevent to the period that was seen as important. Music Trail- I posed this idea for the player to find 60s music to hand to the buskers on the street for them to play. Collecting records or music sheets with notes on was the idea of pick ups behind this. Fashion Trail- also myself could be different trails for different styles of the time. Narrative- david suggested a story behind the hunt giving it a meaning, which i posed a tour guide to show off our buildings would be a nice feature especially for the public to watch rather than play. History Hunt- similar to statue hunt, our tutor Gareth said this would appeal to him finding historical items around the place. Inventory system (collect items to fit in a car boot)- barrie posed this idea so the player could see what they have in game rather than a seperate window. Pick up description- when you pick up an item it does a quick pop up of the item with a rotation around the asset and a brief description on what you have got. Gareths idea- multiple hunt choice bu still have all asset in engine but only give guidnce and pick up abilities on the ones specific to that chosen hunt. Then a badge reward in game achievement for a completed hunt giving the player a sense of a goal to work towards. A final idea will be pinned down shortly i think we are going for the multiple hunts as it gives up a wider range of asset creation and a better style of gameplay for replayability. The treasure hunt is a really good idea as we can position pick ups in specific places so the the player really appreciates the environment around them. Moving on the task set of 2 textured buildings by next week had only 3 people manage it properly some had done but had issues. Myself and Phil thought this might be the case as we identified a few previously to be sturggling on textures, so we did a texturing 101 session using my building poundworld. Phil mainly took the session with some input from myself when questions was posed by the group, then i went round and helped anyone who might have not quite got it. It was dissapointing to see not all the group participating in this helpful tutorial which is invaluable to the project and would have benefitted that individual nevertheless the rest of the group really appreciated the peer to peer learning given. Mainly i worked with James on the topics of Pelt mapping, light mapping, stitching and packing uvs for priority to resolution. I believe he now gets the hang of it but if not we will notice on hand in of his building to the engine so it can be resolved and re-addressed. 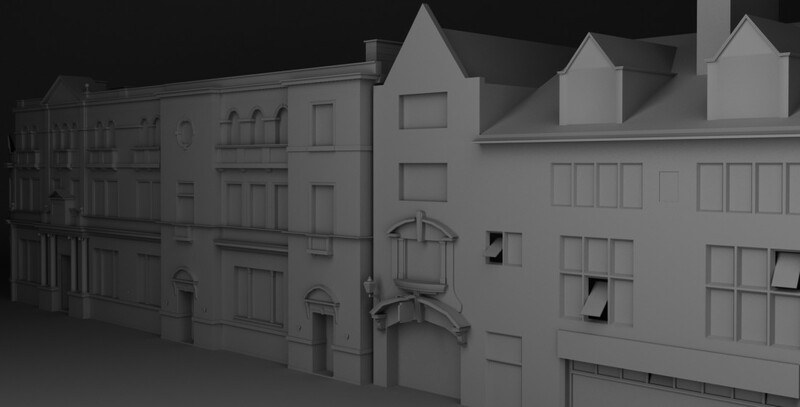 We plan on doing another installment to the texturing 101 series when we move onto normal mapping and Ambient occulsion maps to make the buildings look really nice, showing people how to go about making them in 3dsmax and editing them in photoshop to produce better outcomes on your map. 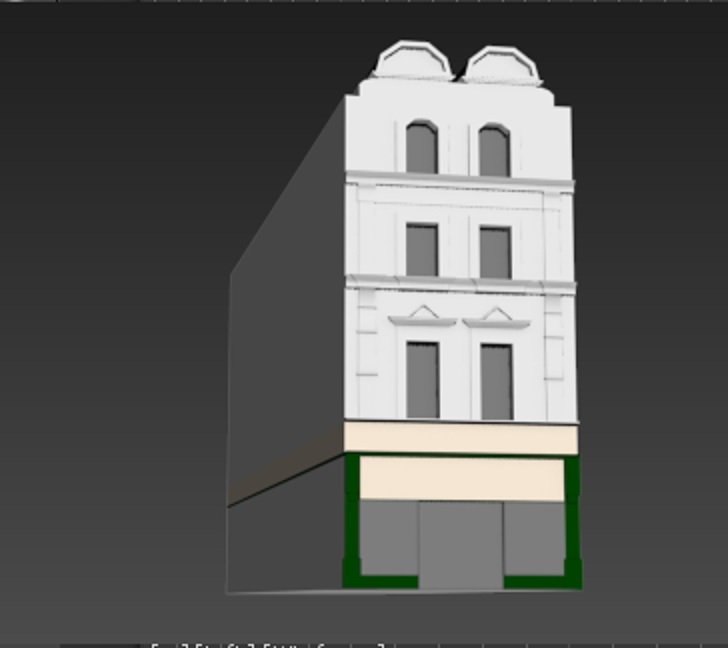 After this was done i picked up another building which is on parliament street, i am well underway with that as we speak and will post results shortly. In the meantime myself and Phil started on a modular road system for the project, which once textured will really start bringing the project to life with the buildings. This was tricky as angled roads and junctions splitting off the multiple roads require quite alot of tweaking and correct snapping but currently whitefriargate and parliament streets roads have been built to scale and snapped together. My contribution was whitefriargate and figuring out the snapping of the connection to parliament street using Phils modular road to get correct angles. This required many measurements we already had but then math to work out the distances from bottom whitefriargate to paliament street then the width on the angle of parliament street then to the crossroads junction at the end of whitefriargate. As you can see its all modular and snapped together, then the road to parliament street is angled on 9 degrees to match the direction of the road, all edge snapped and vertex snapped together. We will implement a slight curve in the actual road when the whole system is done to add realism as whitefriargate does rise up in the middle creating a curve. We plan to do an update video on the project in engine shortly for a detailed visual fly through for everyone to see. Next week hopefully the modular road system will be finished. And everyone has been given 6 assets to do over christmas or before if speed is there with another building. So we are really trying to hammer down now to push the project on, the faster we can build it the more time we have to add and tweak features. 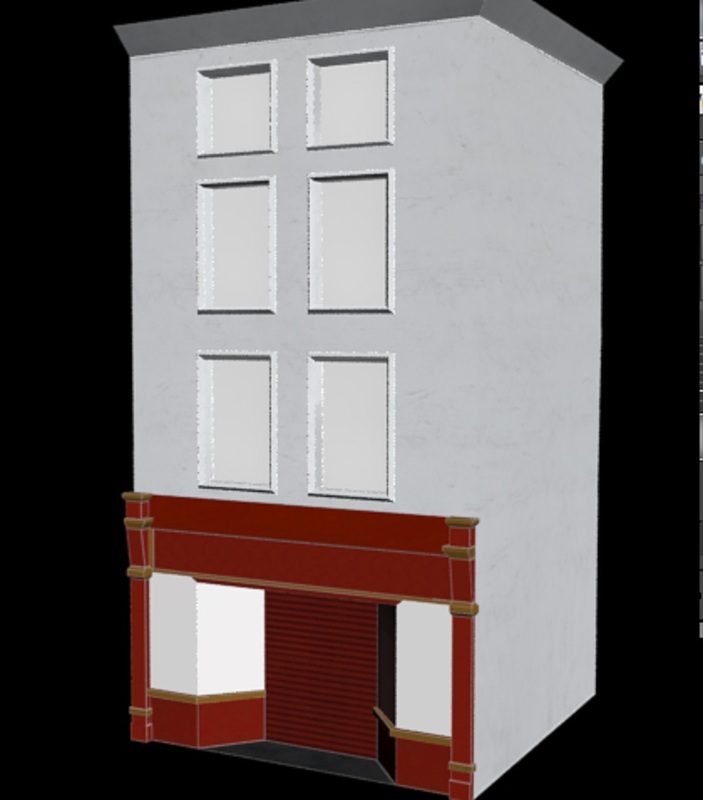 Categories: Client Project, Year 2 | Tags: 1960s, 3D, 3D Model, Autodesk 3ds Max, Buildings, Client, Design Process, Gameplay, Interactive, Mechanics, Modular, Project, texture, texture mapping, treasure hunt, whitefriargate | Permalink.